Missing teeth affect more than just your smile; they affect your oral health. At My Smile Artist in San Antonio, Dr. Imam and Dr. Schroder offer dental implants—the most effective solution for replacing missing teeth and preserving your oral health. Dental implants are screw-shaped artificial tooth roots, usually made of titanium, that are surgically placed in your jawbone. Mimic tooth roots – They are surgically placed in your jawbone. During a healing period of three to four months, the bone will bond to the implants—a process called osseointegration. Stimulate bone – Natural tooth roots stimulate the jawbone, and so do dental implants. The presence of the root forms prevents bone shrinkage, which normally occurs when all of your teeth are missing. It also helps prevents facial sagging that results from bone shrinkage. Provide maximum support and function – Whether you receive a dental crown or dentures, replacement teeth that are anchored with dental implants function better. It’s easier to eat, speak, and smile with implant-supported restorations. Long-lasting – They outlast other forms of tooth replacement—removable bridges and dentures. The durable root forms are anchors that with good care can last a lifetime. Implants fill the spaces left by missing teeth and prevent nearby teeth from drifting into the spaces. They improve your bite and help prevent TMJ problems caused by missing teeth. You won’t experience the irritation and discomfort commonly caused by partial dentures, which are fastened to natural teeth. When implants replace a single missing tooth, they eliminate the need to prepare the adjacent teeth for crowns. 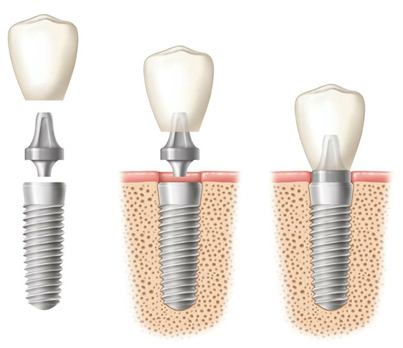 Individual implants – Each missing tooth can be replaced with a dental implant. All-on-4 dental implants – This technique was developed for cases of low jawbone density. Angled implants create added retention and eliminate the need for bone grafting. For additional support, All-on-6 implants are also available. Visit our All-on-4 dental implants page for more information. Implant overdentures – Four or more implants can be used to stabilize dentures. In cases of low jawbone density, grafting might be required. Read the details on our implant overdentures page. Snap-on dentures – Two dental implants are placed in the jawbone, and the denture base is made to snap onto the implants. Both Dr. Imam and Dr. Schroder have completed post-graduate general dentistry residency programs and have received advanced training in both the placement and restoration of implants. In some cases, they will perform the surgery. In other cases, the surgery will be performed by an oral surgeon, and you will return to Dr. Imam or Dr. Schroder for the restoration. Before you receive dental implants, your medical history will be reviewed and 3D radiographic images will be taken. Ordinary two-dimensional radiographs don’t provide enough information to be able to avoid perforations or critical vital structures during implant placement. Only high-quality implant fixtures are used in our office—fixtures that meet stringent quality guidelines from the FDA and the American Dental Association. If you’re interested in the healthiest and longest-lasting form of tooth replacement, call us to schedule an appointment for an exam, or request an appointment online.